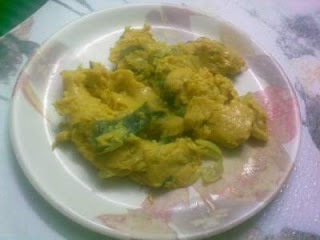 Take besan in a bowl and add water to it.Make it like a dosa batter. Cut onion length wise and green chillies. Add the onion and chillies and saute. After a min add haldi,mirchi,dhaniya and jeera powder. Now add the besan batter and more water if necessary. Keep on stirring continuously so that no lumps are formed. Cook it till the water is absorbed. Do not make it too dry as it gets drier later.